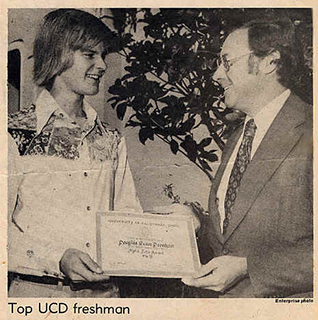 Receiving Alpha Zeta Award, as top UCD freshman, from Dr. Charles E. Hess, then-Dean of the College of Agricultural and Environmental Sciences. Majored in Plant Science: Botany — Plant Systematics, Physiology, Anatomy, Pathology, Ecology, etc. — and Agricultural Technology — Soil Science, Water Science, Greenhouse Design and Management, etc. Excelled in well-rounded education of pure and applied arts and sciences. Mathematics: Calculus and Advanced Statistics. Physical Sciences: Physics, Inorganic and Organic Chemistry, Quantitative Chemical Analysis. Biological Sciences: Biochemistry, Botany, Biology, Zoology, Nematology, Entomology. Social Sciences and Humanities: Cultural Anthropology*, Macro-Economics*, U.S. History, Rhetoric, Philosophy*. * Taken in Summer School at Pasadena City College.